Our in-house team of creative experts goes above and beyond to turn the ideas in your head into the dynamic marketing pieces you need to promote your product or business. Papa John’s wanted to increase awareness of their mobile options, so Preferred created P.O.P. materials featuring QR codes that directed customers to download an app and to sign up for email offers. For Pier One’s “All About Hue” campaign, Preferred created P.O.P. materials featuring customizable fabric choices for the stores’ housewares and furniture departments. Right before the 2013 Super Bowl, Papa John’s and the NFL needed to promote a “Two Million Pizza Giveaway,” so Preferred created P.O.P. pieces that stood out and drew interest. 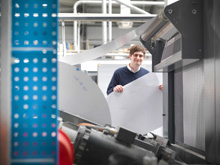 As one of the leading print houses in the region, Preferred Marketing Solutions has a full array of presses – including web, sheet-fed and digital – that keep your projects on time and on budget.